Looking for the best? 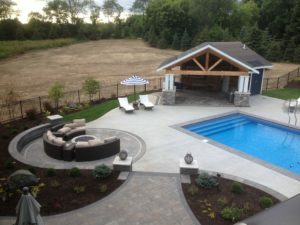 Maplewood landscaping design is the best Landscaping Contractor in Maplewood, look no further, Landscapes Unlimited will be there from the beginning to the end. Whether its a small project or a updated back yard project to entertain the neighborhood we can help. The entryway to your home should welcome people like open arms. There are many ways to create this warm embrace with concrete, both underfoot and as an architectural accent. Concrete is often maligned as being a cold, austere material. Yet it’s anything but. Through the use of color, texture, shape and pattern, concrete can be made warm and inviting. Here are 10 ideas for using decorative concrete to create an attractive, beckoning front entry to your home. Be ready for lots of visitors! Adding a Fire Features or a fire pit as part of your landscaping will extend the enjoyment of your backyard for you and your guests. They provide warmth, light, a cooking source, and ambiance, making them a natural gathering spot for socializing, entertaining, and relaxation. People are drawn to the campfire-like atmosphere, and before you know it, there will be story-telling and laughter. A fire pit can also serve as an important focal point in your outdoor landscape design. When placed where it can be easily seen from your interior living space, it can be enjoyed from the indoors as well. Adding an outdoor structure to your outdoor living area can add significant value to your home. Whether it’s a gazebo, pergola, trellis or other area for entertaining outdoors, an outdoor structure will extend your home outside, adding square footage onto your house. If having outdoor structures has been your dream, then Landscapes Unlimited can help make it reality. Outdoor structures can define a room, and provide you with shelter and privacy in your landscape. A shaded area offers a comfortable place to relax and enjoy the breeze, while an enclosed area gets you away from insects. We’ll create an outdoor living area that fits your personal style by considering how you want the area to fit into your property’s décor. Installing a swimming pool presents a number of custom design opportunities to meet your needs. Decisions regarding size, configuration, depth, type of use (lap pools, sport pools, diving pools, etc), equipment, and storage all add up to a new pool specific to you through swimming pool design. Landscapes Unlimited works with you and the pool contractor to make sure you are asking the right questions and getting the right answers for a successful pool installation. 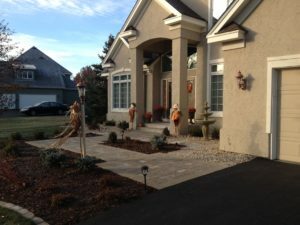 Paver Driveways have become a popular choice for homeowners over the last decade, since they are more visually attractive than traditional driveways, such as poured concrete, asphalt or gravel. Though the costs are higher, the end result will be well worth the added expense. Landscapes Unlimited is at the forefront of paving stone installation. We enjoy what we do, are constantly striving for excellence and warranty our work from the ground up. We believe that as people become aware of the superiority of a segmental pavement and that as we continue to require our customer’s overwhelming approval of our installations, Landscapes Unlimited will continue to be a dynamic leader in an expanding industry. A fabulous patio design can make up a large part of your home’s curb appeal. More importantly your patio is the entrance to your home and can make all the difference in the world to your experience of your home. A well planned and constructed patio design can transform your home and give it that “Wow Factor” that you are looking to achieve. Most importantly it’s one of the lowest cost renovations or additions that you can make to your home with the quickest build out time. Retaining walls are a relatively simple way to add aesthetically pleasing visual interest in your landscape project for your home or business. People with many hills in their yard often have a hard time using the space effectively and beautifully, especially if the hills are very steep. Retaining walls are multi-functional! If those difficult slopes are walled off properly, they become much safer as well as more attractive and usable. Terraces can be built into the retaining wall design as well for added flowers and plants which can create a lovely flowing landscape look. A variety of retaining wall materials are available so that your Landscapes Unlimited project can suit your style as well as compliment the exterior of your home or business. Having a properly installed retaining wall is important for your safety. The professionals at Landscapes Unlimited will start with a proper foundation when installing your retaining wall, large or small, to avoid any buckling or shifting. We can install free standing retaining walls, walls with seating built in terraces, segmental retaining walls (SRW), or simple garden walls to help keep your plants safe from unwanted visitors. For a more natural look, we can install a boulder wall using various sizes of rock and put in plants such as creeping sedum to continue the natural look. Who needs a vacation? In the last few years, homeowners recognized the advantage of creating their own backyard resort through sport court design. Let’s face it. “Stay-cation” is now a part of our vocabulary. While most people think a swimming pool is just the ticket, more families are looking at sport courts of all kinds. Limited space? Create a driveway basketball court from brick or concrete pavers, like the one we designed and built in Maplewood, MN. We have all seen tennis courts, basketball courts and trampolines at the neighbors. And backyard hockey rinks are a favorite here in Minnesota. But consider adding one of these less common sports or games to your backyard – chess boards, horseshoes, putting greens, bocce ball, volleyball, shuffleboard, or badminton. No reservations necessary. Landscapes Unlimited is your complete, full-service solution for soft, subtle and elegant Landscape Lighting and Architectural Accent Lighting. We have over 10 years of experience in custom designing, installing and servicing high quality outdoor lighting systems throughout the Lake Elmo, MN area. Our commitment is to treat each customer’s home or business as if it were our own. We have a professional team of outdoor lighting designers and installers ready to handle all of your lighting needs. We offer both residential and commercial lighting solutions. We have had the opportunity to illuminate various styles and sizes of homes, outdoor living areas, landscapes, decks, patios, pool areas, walkways, driveways, water features, as well as gated communities, office buildings, churches, and country club facilities. From natural-looking streams to architectural fountains, water features are important focal points in the landscape and some Maplewood, MN homeowners opting to have more than one. Some homeowners will put a fountain/bubbler at the front entry to greet guests. Others place water features close to outdoor living spaces or near a fire. Some water features are near swimming pools, hung on garden walls, or are fountainhead sprays hidden in a pool deck. Even the smallest spaces can have a water features. Containers and urns serve quite nicely as self-contained fountains. Yes, you can build your own bit of paradise with a water garden custom designed to your specific preferences . Each site and each client is unique – take the time to study your site and decide exactly what the design should accomplish. The success of your pond, waterfall, pond-free system, fountain or other water feature relies on site-specific design, project planning, quality component selection and a bit of manual labor. We provide everything you need (except the labor!) for your successful project. Creating your own pond, waterfall, stream or other water feature is one of the most rewarding home improvements you will ever complete. If you can use a shovel and follow simple directions, you’ll soon be able to enjoy countless hours of peaceful contemplation beside your own water garden. Like the unique personality of your home, no two natural stones are the same. Finding natural stone that fits your design — color, pattern and movement — is a four-step process that is as exciting as it is personal. Landscapes Unlimited will facilitate the selection process and help you choose the perfect natural stone. Once you’ve decided, your fabricator will purchase the slabs, fabricate them to specifications and install the natural stone according to the schedule of the build. Landscapes Unlimited specializing in custom deck building, screened porches, sun rooms, and gazebos. Proudly serving the Maplewood, MN area, we have developed a reputation for excellent service in delivering quality materials and workmanship in a timely manner. When you contract with Landscapes Unlimited , you can expect a clean cut friendly crew of craftsmen who take pride in their work and will make every effort to complete your job as quickly and skillfully as possible. Together, we can design and build the project of your dreams. We work with wood, plastic, composite, glass, metal, cable, travertine, rubber and more! During the design phase, we will quote all material and size variations that interest you, as well as providing project photos and material samples.